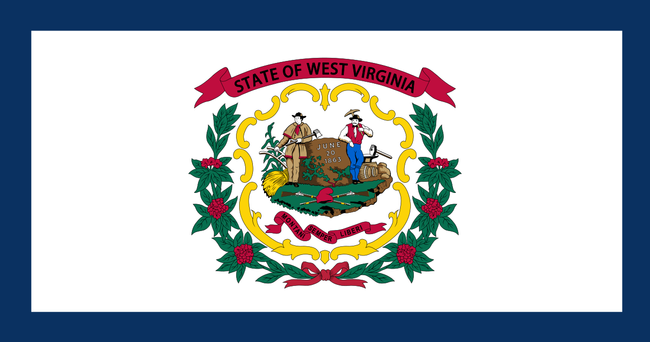 West Virginia seceded, or broke away, from the state of Virginia in 1863 at the height of the Civil War to become its own state, the 35th to ratify the United States Constitution. West Virginia's boundaries are the Ohio River and state of Ohio to the west, the southwestern corner of Pennsylvania to the north and east, western Maryland along the Eastern Panhandle, Virginia to the south and east and Kentucky to the southwest. West Virginia is somewhat geographically diverse, but for the most part lies within the Appalachian mountain range. The Eastern Panhandle, which contains Martinsburg and Harpers Ferry, is complemented by a second "panhandle", the narrower Northern Panhandle, within which lies the city of Wheeling. State capital Charleston is a transition between the Appalachians and the Ohio Valley, and is served by its own river, the Kanawha. Beckley serves as a southern hub for the state, and Huntington a gateway into Kentucky. Elkins, meanwhile, is a fair representation of West Virginia's "mountain country". The Greenbrier in the middle of the state is a popular winter skiing destination. Morgantown to the north is the home of the West Virginia University. Interstates in West Virginia include Interstate 64, which makes up a Huntington-Charleston-Beckley corridor, as well as Interstate 77, which is the West Virginia Turnpike for most of its length through the state. I-64 and I-77 run concurrent between Beckley and Charleston. Interstate 79 has its southern terminus at Charleston, and runs up past Clarksburg, Fairmont and Morgantown before crossing into Pennsylvania en route to Pittsburgh and Erie. Interstate 68 connects Morgantown to western Maryland, Interstate 70 bisects Wheeling, and Interstate 81 runs through Berkeley County and Martinsburg in the Eastern Panhandle. West Virginia's U.S. Routes include the fairly new U.S. Route 48, formally Appalachian Corridor H, which along with U.S. Route 50 forms a southern border for the Eastern Panhandle. U.S. 50 has two segments within West Virginia: one between the Ohio border near Parkersburg and Maryland's westernmost border, and the other from its temporary emergence from Maryland to the Virginia line just west of Winchester. U.S. Route 19 is a feeder for I-79. U.S. Route 250 is a northern corridor through the state, and U.S. Route 33 a central one. U.S. Route 219 runs along the eastern edge of the state.